My name is David, and I live in an apartment in Geva’ot. Five good friends live with me, and together we are learning how to cook for ourselves and how to keep our rooms and the apartment clean and tidy. Our apartment counselor explains how I can spend my free time doing what I enjoy – for example, playing football or taking a walk with the dogs. I have a host family in Geva’ot that I am very close to; every Shabbat I enjoy a meal with them. I am happy to be living in an apartment with friends, because at home I’m bored and have no friends. My parents are at work, and my brothers and sisters are already married. I’m Ronit’s mother. Ronit, our eldest daughter, is 26. Ronit was born perfectly normal, and at age 6 she developed severe epilepsy. The illness caused damage to her brain, and since then she has lived with seizures. Life at home was extremely difficult. Because of the seizures, Ronit required constant supervision, as well as nursing care, because she loses control of her bodily functions. Of course, there are other children at home as well. Fortunately, the Sadna opened an apartment for girls. On one hand, this framework offers the care and supervision that Ronit needs; on the other hand, it allows her to be part of a group and to integrate into a community of individuals and families who are warm and accepting. Ronit is very sociable; she enjoys being with her friends in the apartment and is on good terms with the families living nearby, who always say a friendly hello in the street and during joint communal activities. The Sadna Communal Village is a study-residential-occupational framework for young adults (15-26) who have trouble integrating into a regular social and study environment owing to various mental and/or physical disabilities, such as Downs’ Syndrome, autism, MS and more. Some of these youngsters also have a difficult socio-economic home background. 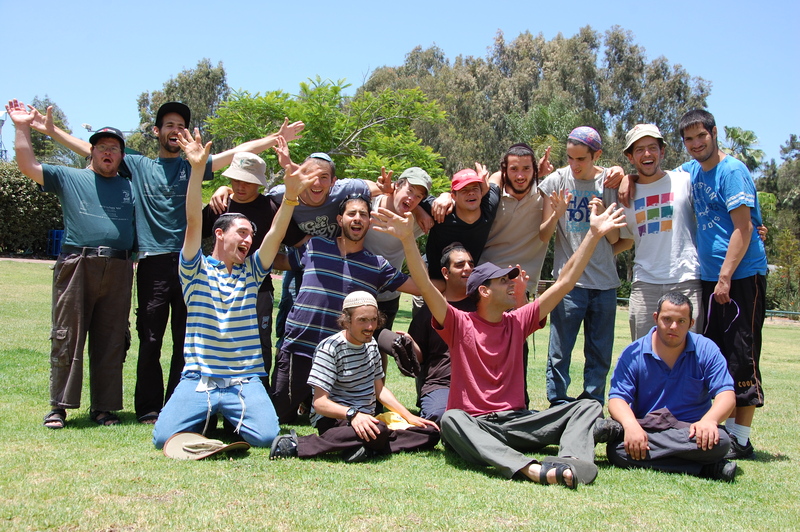 The Sadna residents are graduates of the Reshit school in Geva’ot, which integrates children with special needs within a regular school environment. At the end of 8th grade, the special-needs students who are capable of integration in a regular high-school move on, along with their friends, and receive personalized assistance in their new schools. The Sadna was launched to serve those who are unable to pursue this course. 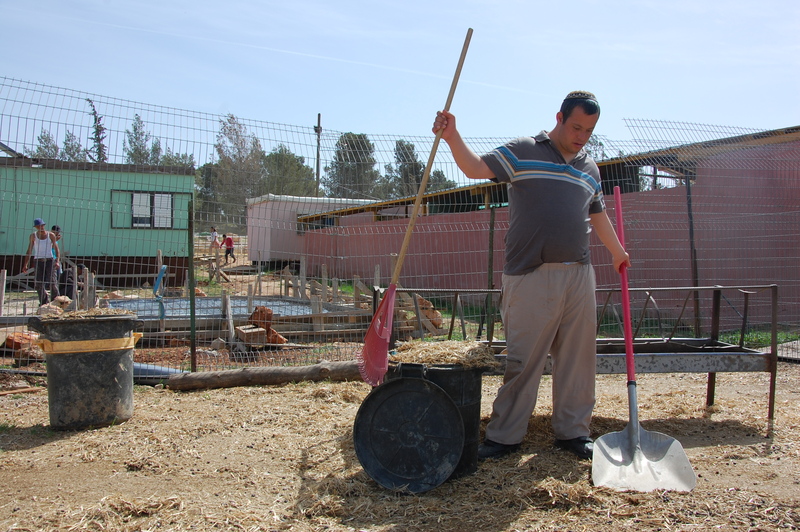 The communal village, set in the quiet, green surroundings of Geva’ot, offers specially adapted residential conditions, and the youngsters live in their apartments 7 days a week, including festivals and holidays. They visit their parents from time to time, but the Sadna is their home. What is unique about living at the Sadna? This unique communal village provides accommodations in an apartment together with a number of other young men or women. It allows the youngsters to study and to work in accordance with their abilities, and to maximize their individual progress. Agricultural work was introduced into the program to help prepare the youth for adult life. The students are trained as workers and as instructors. The professional staff lives on-site, supervising the program and monitoring the students and their progress on an ongoing basis. The youth are employed mainly in farm work, in the dairy, in the stables, and as therapeutic riding instructors, as well as in the arts center. This comprehensive system offers structure, nurtures a sense of independence, and maximizes self-sufficiency. Government ministries, the National Insurance Institute, foundations such as the Shalem Fund, and private donations. There is also an annual nation-wide women’s fundraising initiative, “Swim4Sadna”, in which participants swim across the Kinneret (Sea of Galilee), each raising NIS 2,000 for the Sadna. What can you do to help us open additional residential frameworks? We would like to improve conditions for the residents of the Sadna and to help dozens more young adults who are waiting in line for acceptance into this framework. Your contribution will help us to help them.